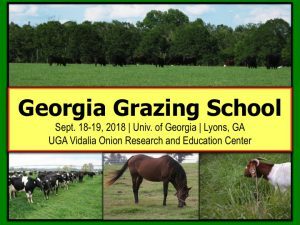 UGA Extension will host a two-day Advanced Grazing School on September 18-19, 2018 that will provide attendees with a deeper understanding of two key aspects of their grazing systems. The focus areas will be on choosing the right pasture species, designing a grazing system that works best for your operation, and how to profitably fertilize pastures for optimal performance. Training will take place in both classroom and field settings, with several hands-on learning experiences geared toward these areas of focus. The classroom portion of the course will be held at the Vidalia Onion Research and Extension Center in Lyons, GA. Then on the second day, the group will finish up the classroom portion before visiting Newly Halter’s farm where participants will take a close look at his rotational grazing systems. Cost of the two-day program is $150 per person. This registration fee includes a 250-page notebook full of resources on the subject matter, along with lunches and breaks on each day, and dinner on the first night. Registration is limited and participants are accepted on a first-come, first-served basis. So, interested persons should register soon. You can register by contacting the Tattnall County Extension Office at (912) 557-6724. If you’d like to register online or you would like to sponsor or exhibit at the Advanced Grazing School, visit our online registration page here. For those of you looking for a more introductory course…. 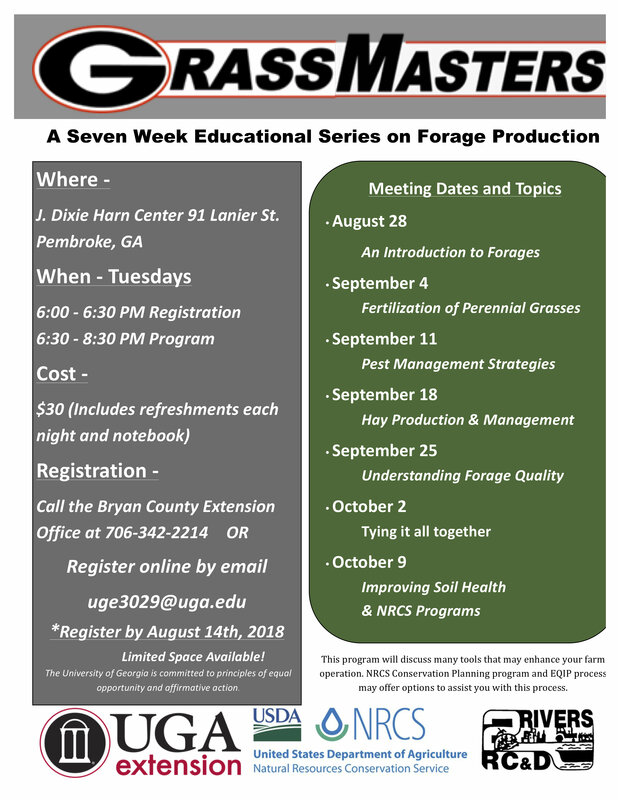 The GrassMasters program is a seven week series of educational workshops that focus on forage production. This program is an INTRODUCTION to forage production systems and is highly recommended for those of you just getting your “feet wet” when it comes to planning or improving a forage system. Posted in cattle, GrassMasters, Grazing, News, Warm Season Perrenials, Workshops. Bookmark the permalink.